If you want to learn more about it, check out this page on Wikipedia HERE. Now for today's post.....I have another card for the "Loving On" - Your Next Stamp. I love this set of champagne glasses from "Clink". You can use this set for an anniversary, for the New Year, to celebrate a new baby or a new job...it's just very versatile. I started with a top folding A2 card base of black cardstock. I then embossed a piece of metallic white cardstock in an embossing folder from Couture Creations called Annalee, which I adhered to the card front. I then stamped the glasses on a piece of vellum and embossed it with Sparkle embossing powder by Ranger. I die cut it using the matching "Clink die" and adhered it to the card front in the center. Next I die cut the "Fancy Cheers die" a few times out of thick black cardstock and glued them together. Then I embossed the word with the same Sparkle embossing powder and adhered it to the card front under the glasses. The final touch was to adhere a few black sequins to the card front. I hope you liked this easy card. Remember to leave a comment below and on each of the other blog posts in this "hop" to be entered to win a stamp set from Your Next Stamp. Here are links to all the posts (other than today's post) so make sure you go check them all out and leave comments! Until next time - Hugs from Brasil!! Hello World Of Michael Trent readers. I’m Katie Bolinger and I have been paper crafting for nearly 20 years. As a graphic designer I spend my days looking at a computer screen, I started paper crafting so I could be creative after work without having to look at a screen. I’ve tried a lot of different papercrafts but I always come back to making cards. Three years ago I tried Project Life to document the first year of our puppy’s life. I took a lot of pictures of my son and our dog as they grew. A lot of pictures. When I had the select few I planned to use printed I wanted a number of them cut to 3”x4” with rounded corners. This was going to be a pain. I searched the interwebs for a die I could run through my Cuttlebug and at that time there was only one solution, Your Next Stamp Die Set Journaled Weekly (YNSD69). 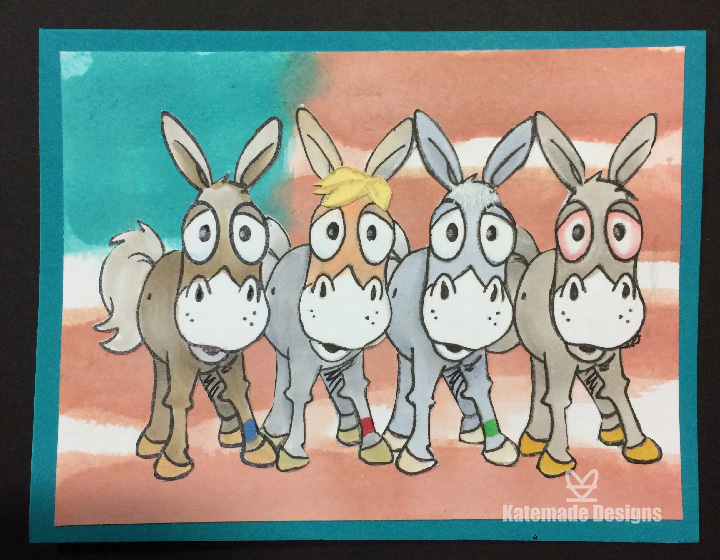 Visit me at Katemade Designs to see more creations using Your Next Stamp. To see how Katie is "Loving On" - Your Next Stamp head over to her blog - HERE - and check out her creations. Remember to leave a comment on her blog in order to be entered to win a free stamp set by Your Next Stamp! If you want to see my post on how I am "Loving On" - Your Next Stamp - just click - HERE - and remember to leave a comment on my blog too! But it’s back now and I need to thank Katie over at Katemade Designs! She posted on Facebook that she was going to do one of her “Loving On” series using stamps by Your Next Stamp and she was looking for others to join her. So here I am! I have loved products by Your Next Stamp for a few years now. Not only are they adorable but they are really well made, their phrases come in some really nice fonts, and their customer service is amazing. So this week I am “Loving On - Your Next Stamp”. I will have two posts this week and I will be sharing posts from some of the other folks along on the hop. For today’s card I used the Word Critters - Spring Birds set along with the matching Spring Birds Die set. I started by making a top folding card base of white cardstock - 4.25” x 11”, scored at 5.5”. I then cut a piece of black cardstock and applied it to the card front. Then I found a cool piece of scrapbook paper in my stash that had leaves on it so I cut a piece to 4” x 5.25” and adhered that to the center of the black cardstock. Next up I stamped the two birds and the nest with the eggs, die cut them, and colored them in with Tombow markers. I then cut a piece of white cardstock, 2.75” x 4”, and stamped the branch,the hearts and the phrase, and colored them in with Tombow markers. I adhered this to a piece of black cardstock, 3” x 4.25”, and then adhered the nest and birds with pop dots. The last thing I did was to adhere this piece to the card front and I was done! I hope you enjoyed this quick and easy card using stamps and dies from Your Next Stamp. Karen, the owner at Your Next Stamp, has offered a stamp set to one lucky winner this week. So leave a comment to enter and get yourself some of the YNS love.